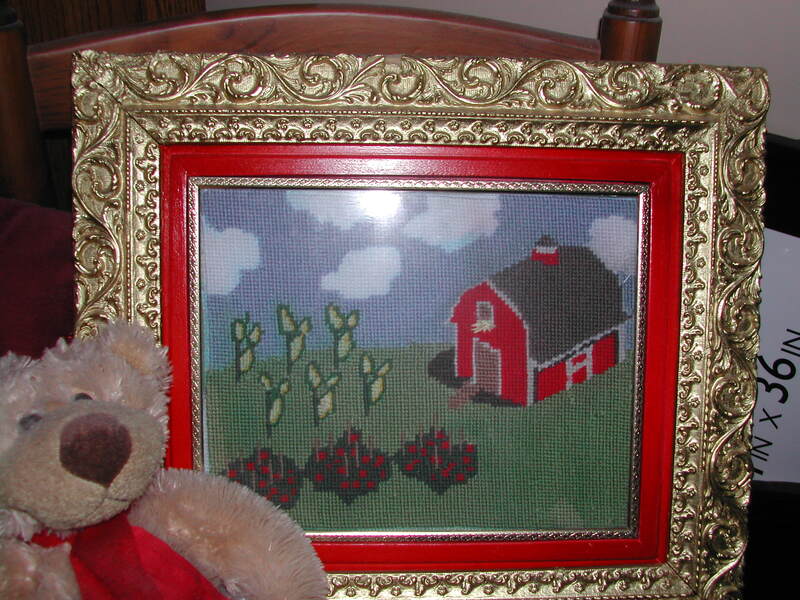 Recent projects: Bathroom rug, button wall decorations and cross stitch projects. Haven’t had a chance to do much crafting this weekend, so thought I would share some past crafts I completed. Most ideas were found on my favorite site, http://www.pinterest.com. Check it out. 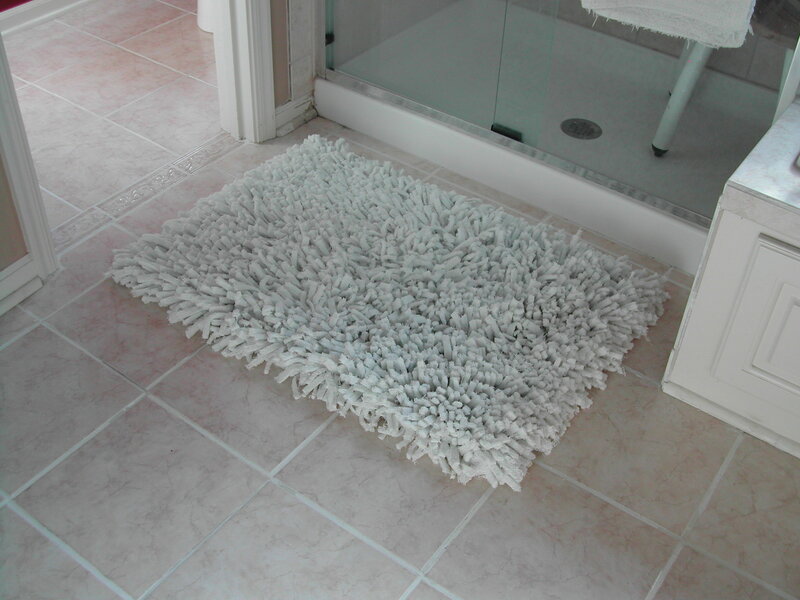 So the first one is a recycled towels into a bath mat. It is so warm and fluffy. And it looks great in my bathroom. I did it a little different than the directions that I had found, I didn’t actually knot each pieces after pulling through the grid, the knots tended to make the rug too ‘hard’ feeling and it was more difficult working with the pieces. So, to keep it from coming undone, I sealed the back with an adhesive used for just this purpose. Next up, was a fun little project that again, was inspired by something I saw online. Only I wanted to do it bigger and better. I am a quilter and sewer for many years, and one thing I use to decorate by sewing/crafting room is buttons. Hundreds, thousands, maybe even millions of buttons sorted and organized and on display in beautiful apothecary-style jars. So when I saw the large button wall art, I knew I was going to have to do this too. So, I kept my eye peeled for round cutting boards. I found a couple at the large box stores, but they were expensive, so I would look for anything that might work while I visited estate sales and garage sales and thrift stores. I was rewarded with three large round cutting boards. Painted in bright, happy colors, and then drilled holes and threaded large upholstery rope to simulate thread. Aren’t they great? I have also found that I enjoy cross stitch, but really never found any pre-printed patterns that I liked. They always seemed so, well for lack of a better word (and not to offend anyone), too mature. So I set about printing my own patterns. I would search for things on the internet that I enjoyed, and then could print them with my ink jet printer onto the grid material. I was surprised how simple it was. 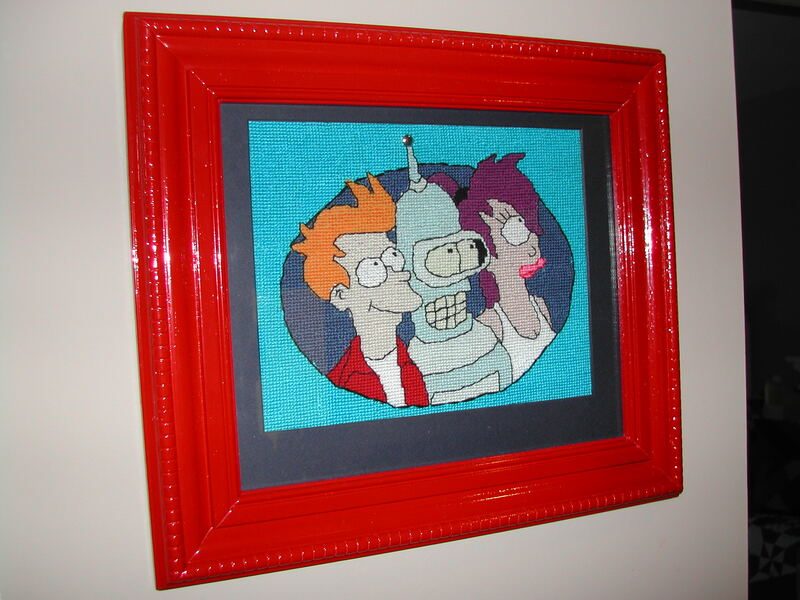 The first one was for my son, he is such a fan of the show “Futurama”, that I found this wonderful image of the main characters: Leila, Fry and Bender. Once completed, it was easy to stretch onto a cardboard backing and fit into a frame. This frame was another of my estate sale finds, spray painted with an intense bright red. My son loves it. The next one was based on my own interest (or maybe you might call it ‘obsession’) of Farmville game on Facebook. I couldn’t really find one that I liked, so I took components and put them together and created my own image in Photoshop. Again, printed it on the cross stitch fabric and completed it using standard embroidery floss. Again, got lucky with the frame, a wonderful two part frame that I spray painted gold and red. Shortly after finishing this, I swore off playing the game. It started to consume way too much time and I found myself, at times, calling my son to harvest crops before they withered. Yep, it had turned into a full blown obsession. Okay, so that is a few more of my finished crafts. More to come. I am really close to finishing my one big project, the thing that I am calling ‘my craft cabinet’. I hope that you will come back and visit.